Taking an active role in your health and communicating with your doctor is critical to getting good healthcare; that includes discussions around cost. Here are some tips on preparing for discussions with your doctor about price. Get educated. Before you go to your appointment, become familiar with your health plan. Find out about your co-pay, deductible and what procedures are covered. Take your insurance information with you. Bring your insurance cards and information with you to your appointment and mention any changes to your insurance since the last time you visited. Let your doctor know that cost is important to you (and so is your healthcare). Chances are that your doctor isn't thinking about the cost of the procedure, so it's up to you to let your doctor know if you're insurance plan doesn't cover his recommendation. Ask about your options for free preventative care. Health plans are required to pay 100% for your annual physical and other age and gender appropriate preventive screenings (e.g. a screening mammogram). Check with your HR department or your doctor about what care is available to you. Avoid high-priced hospitals for MRIs and other imaging procedures. Independent, standalone facilities, such as Shields MRI, can provide identical imaging services for a fraction of the cost at a hospital. Ask about pricing options BEFORE your test if possible. Identify your closest urgent care clinic. Rather than going to the ER which can cost thousands, when you can’t get in to see your primary care doctor, an urgent care clinic can be very affordable for non-emergency care after hours and on weekends. Look for your local options like ‘Minute Clinic’ for these situations. Discuss choices and alternatives. Make sure you understand what your treatment involves and what it will or will not do. If your doctor suggests a treatment that you know is going to be expensive, ask if there are other treatments that might work or if less expensive choices are available. The doctor can work with you to develop a treatment plan that meets your needs. Don't hesitate to ask about cost. If costs are too expensive, the doctor may be able to suggest less expensive alternatives. If the doctor does not know the cost, ask the office staff or scheduler, or shop around yourself. Then call your doctor and ask for their advisement on the lower-cost treatment. When it comes to your healthcare and costs, you always have a choice. Shields MRI facilities can be thousands less per scan when compared to non-partnering hospitals (for the same procedure!) With locations throughout Massachusetts, including several in Boston, getting the highest-quality MRI is convenient and costs less. 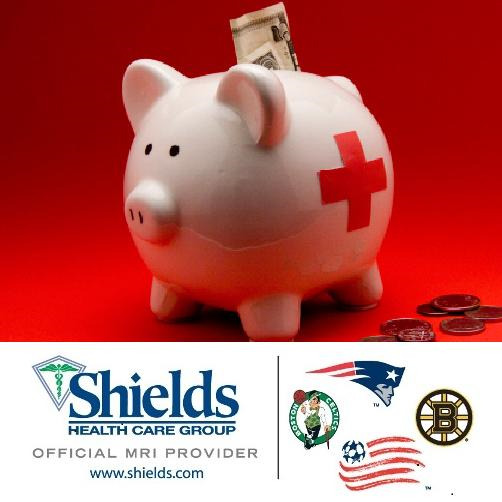 As the official MRI provider for the Patriots, Revolution, Celtics and Bruins, when you choose to go to Shields MRI, you'll get Shields signature champion service!